Our Robo-Boogie competition asked children to create a dancing robot and the public voted to decide the winner. Today we are pleased to announce the winner was Daisy from Abbey Catholic Primary School in Erdington, Birmingham with her awesome robot Lieutenant Polka Flux! 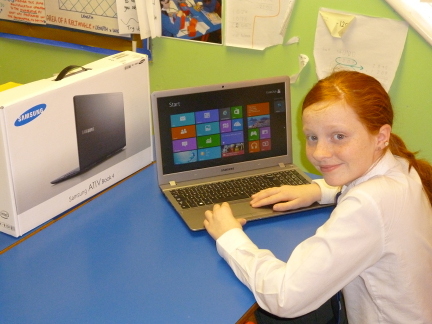 Daisy says, “I enjoyed entering this competition, it gave me a chance to learn new things on the computer and a chance to reward myself and school.” HIGH FIVE DAISY! We’d like to thank everyone who took part – if it was up to us to decide a winner it would have taken all day as they were all so amazing! You can see all the other entries here and continue making your robots dance on the Robo-Boogie site. Happy holidays! Code Club is a nationwide network of volunteer-led after school coding clubs for children aged 9-11. We’ve been reflecting on what we’ve achieved this year and thought we’d write a little report so you can see how we’ve been getting on. 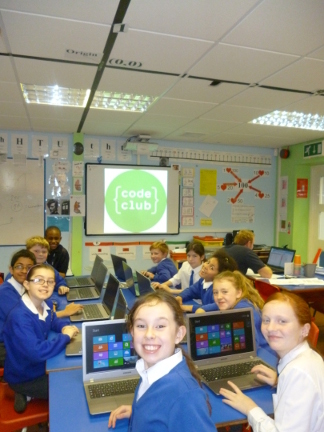 In September 2012 Code Clubs started in 120 schools. By September 2013 we had reached 1000 clubs, and in mid-December 2013 the number stands at 1575. With an average club size of 14.9 this means around 23,000 children are currently learning to code in a Code Club and our volunteers report that the drop out rates are extremely low. 40% of children in Code Clubs are female. With only 6.5% of Computing A-levels being taken by female students in 2013; it is encouraging that Code Club is reaching younger girls. 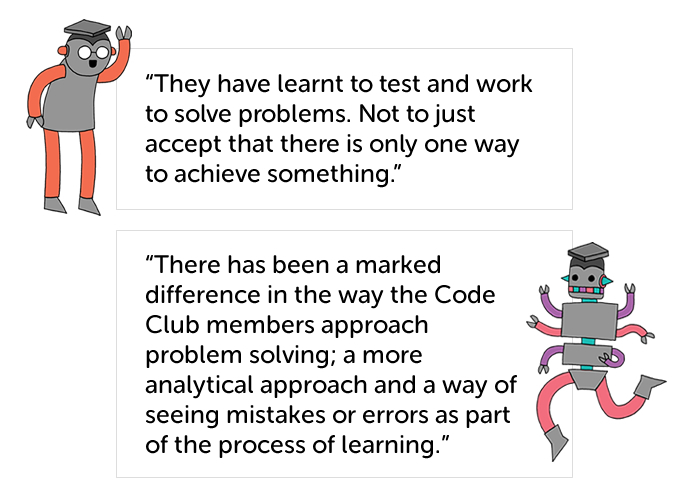 Teachers reported that less than 10% of children in their club had experience of coding prior to Code Club and all of them felt that the children in the clubs had made progress learning to code; half felt they had made a large amount of progress. In addition to this, 75% of volunteers reported good programming confidence levels within their group. We also asked our volunteers rate the children’s confidence with different programming concepts. Most of them reported that the children are at least reasonably confident using a variety of programming concepts; though children are reported as being less confident with debugging than with any of the programming concepts. The projects we write are given to the children by volunteers and teachers to teach children how to make games, animations and websites. The adults then support the children to work through the projects independently. The children start with Scratch then move onto HTML & CSS. From September 2013 some clubs have also moved onto our new Python projects. 92% of teachers felt our projects were pitched at the right level, the remaining 8% felt they were too hard. We like this fact as it means we are challenging the children in our clubs. 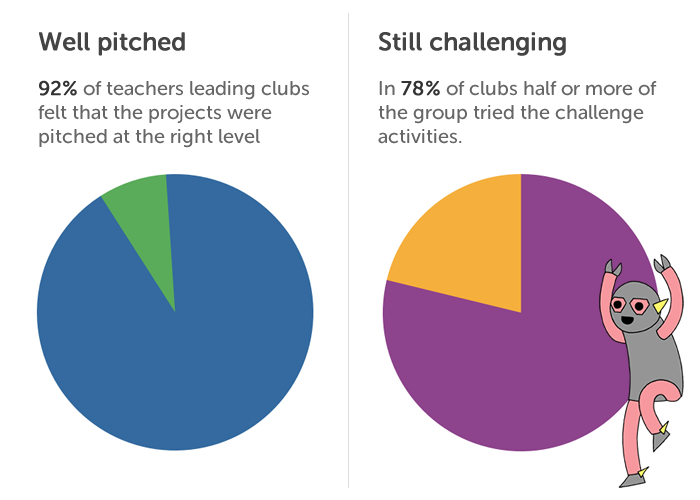 Another encouraging fact is that in 78% of clubs half or more of the group tried the challenge activities. These activities encourage the children to adapt their work and apply what they have learnt. 45% of clubs are led by teachers from the school who feel confident with programming or want to learn more by doing it themselves. 46% of them say they have used our resources during their ICT or Computing lessons, not just in an after-school club. Whilst our projects aren’t designed with this in mind it shows that the need for resources like ours is considerable in a classroom setting. Teachers unanimously described how running a club has been great for their professional development. 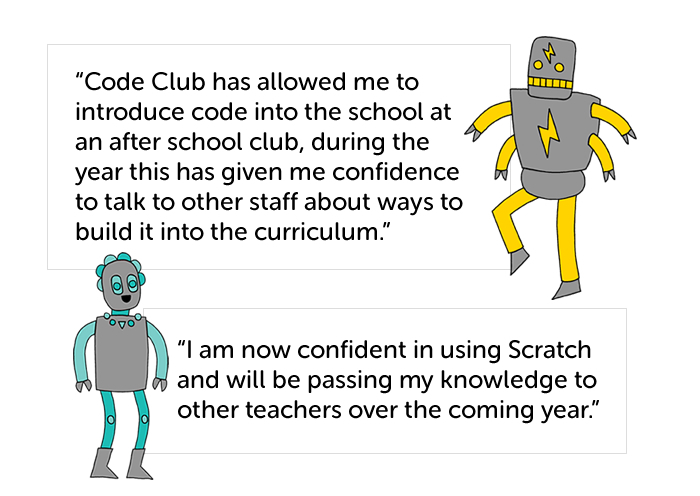 Who has supported Code Club since September 2012? As Code Club is a not-for-profit we rely on grants and partnerships to fund our team and grow. This year we have been supported by grants from Nesta, the Nominet Trust and Google RISE. We have also been supported through our partnerships with ARM, Samsung and Canary Wharf Group. 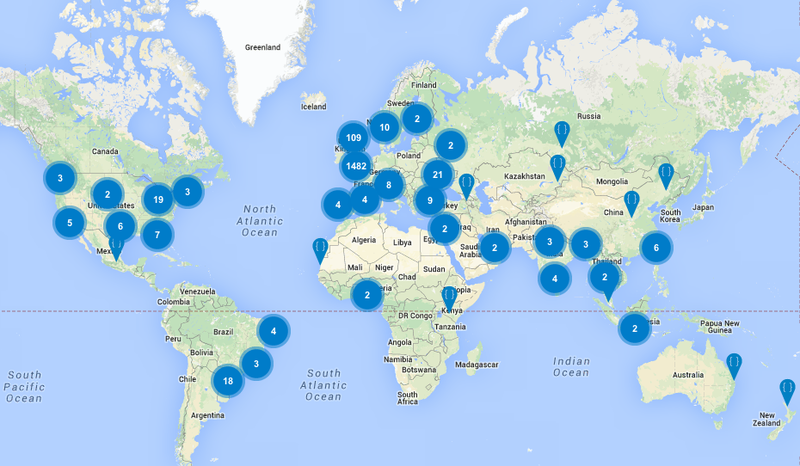 We launched Code Club World in June 2013 as we had so many requests from people around the world to start Code Club in their country. We decided that we’d just help them set it up themselves. There are now over 70 clubs in 35 countries around the world, on every continent except Antarctica (we’re working on that!). Our materials are being translated by volunteers around the world and have been translated in to Brazilian Portuguese, Catalan, Dutch, English, German, Norwegian, Spanish and Ukrainian. We’re working with people in Argentina, Norway, Luxembourg, Ukraine to help them set up Code Club organisations that will be able to support their local volunteers. The whole team would like to say a huge thank you to all the awesome people who run Code Clubs across the country, you are truly amazing in your generosity and enthusiasm and we couldn’t do it without you. We’ve got loads more planned for 2014 so watch this space! On Saturday 30th November, Croydon Tech City held its first Future Tech City event, in a drive to get a Code Club into every primary school in Croydon. There are 95 primary schools in Croydon and Future Tech City are determined to put a Code Club in every single one. With an enthusiastic and dedicated team, they are already doing fantastic work in raising aware of not only Code Club but the importance of teaching children how to code. Schools from around the borough were invited to attend, and there was a Code Club running in the IT suite led by Paul Sinnett, Marc Grossman and Saleha Salahudin who run Croydon’s very sucessful library-based Code Club. At the end of the event the children were brought into the conference theatre and the games they had create shown off. Code Club looks forward to working closely with Croydon Tech City in the future!